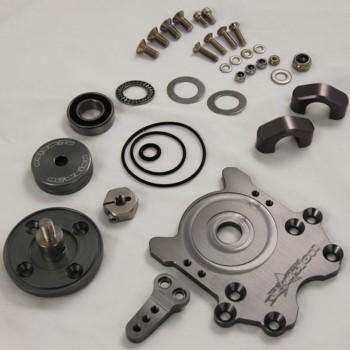 Billet aluminum steering system without turnplate. Stainless Steel Turnplate shaft rides in two O-ring sealed bearings. Included special machined Blowsion Krok Kollar stainless lock nut with set screw and 7/8″ Handlebar Clamps. Fits all stock or aftermarket Yamaha design handle poles. Steering head & bearing housing are carbon anodized for corrosion protection. Fits all years Yamaha SJ and Fx1, Kawi 750 and SXR 800 Conversion pole conversions, Polaris Octane and Hydrospace. Works with Blowsion Kawasaki and Yamaha billet turnplate.